What conditions does Evista treat? List Evista side effects by likelihood and severity. Before using this medication, tell your doctor or pharmacist your medical history, especially of: blood clots (including in the legs/lungs/eyes), stroke, mini-stroke (TIA), heart disease (blocked blood vessels in the heart), heart attack, high cholesterol, irregular heartbeat called atrial fibrillation, high blood pressure, smoking, kidney disease, liver disease, heart failure, cancer, high blood fat (triglyceride) levels caused by estrogen treatment. Tell your doctor if you just had or will be having surgery or if you will be confined to a bed or chair for a long time (such as a long plane flight). These conditions increase your risk of getting blood clots, especially if you are using raloxifene. You may need to stop this medication for a time or take specialprecautions. What should I know regarding pregnancy, nursing and administering Evista to children or the elderly? Some products that may interact with this drug include: bile acid-binding resins (such as cholestyramine, colestipol), estrogens. Does Evista interact with other medications? 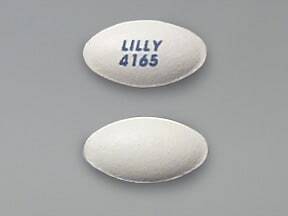 This medicine is a white, elliptical, film-coated, tablet imprinted with "LILLY 4165". Are you considering switching to Evista? How long have you been taking Evista?